Paul Paray was always well known for his mercurial interpretations of French music and this five-disc set contains a veritable feast of works for all those Francophiles who remember this great conductor. Although the Mercury transfers have come up trumps, I fail to understand why Decca has not remastered the recordings for SACD in three-channel as they did in the previous single disc issues released a couple of months ago. The first disc contains a magnificent performance of the famous 'Organ Symphony' by Camille Saint-Saëns. Marcel Dupré' is the outstanding organist and the fresh flow of the music is securely led by Paray in what is one of the best readings of this overtly bombastic work. Paray's own Mass for the 500th Anniversary from Joan of Arc's Death is an interesting curiosity that contains some excellent work for chorus although it is admittedly rather weak in structure. Paray was always a fine interpreter of Lalo and his readings of the 'Roi d'Ys' and 'Namouna' Ballet Suite are models of their kind with recordings that contain just the faintest hints of distortion. The Chausson Symphony is also a white hot recording that has been justly famous for over five decades and here it is wonderfully resurrected in superb sound. Henry Barraud's 'Offrande' is also beautifully done showing the Detroit Symphony's virtuosity under their charismatic conductor. Another famous Paray recording is Ibert's 'Escales that is definitely the best interpretation on disc after more than forty years. The Ravel pieces are also brilliantly executed with 'La Valse' particularly exciting and riveting. The rest of the set is full of party pieces with exhilarating recordings of the Bizet suites, overtures by Hérold, Auber, Thomas and the obligatory ballet music by Gounod and Berlioz from the grand operas. 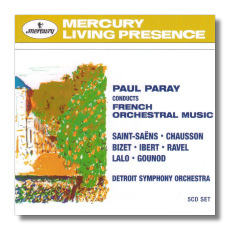 Definitely one of the finest sets in the recorded history of Mercury, Paul Paray's collection of French music is a must for any serious Francophile.